Home FAQs Is it compatible with Mageplaza Social Login? Is it compatible with Mageplaza Social Login? Of course it is. One Step Checkout allows visitor log in or sign up a new account by Magento 2 Social Login under popup box, without directing them to other pages than the current checkout page. This function will strongly help you in decreasing abandonment cart rate. 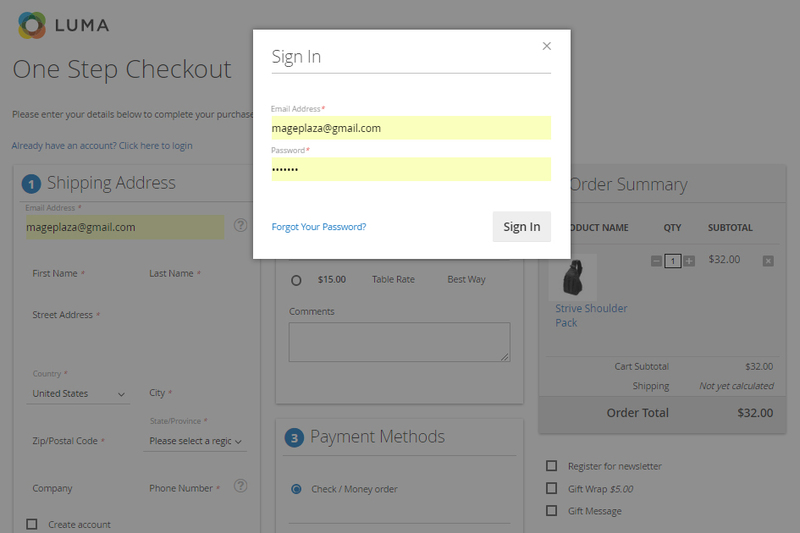 Add a custom checkout field in Magento 2 Does Mageplaza One Step Checkout compatible with YourStore Theme? After installed my checkout page is blank now? Can I change checkout's design into (a) columns? Can I change the apprearence by customing the CSS? Can I manage field's order in checkout page by myself? Could your extension be compatible with my custom Payment/Shipping? Does you extension have House numbers after address? Does your One Step Checkout support Delivery Date? How to add header and footer on One Step Checkout extension? How to translate One Step Checkout to other languages? How your One Step Checkout is compatible with other modules? Is it compatible with Mageplaza Google Tag Manager? Is it compatible with Mageplaza Social Login? Some addresses are not suggested in the dropdown list? The checkout page is not work properly with my theme. What are the differences among One Page Checkout extensions? Where can I find One Step Checkout's user guide?